The HS-20 Series is the optimal solution for volatile component analysis. Its superior performance and user-friendly design support all types of analyses, from research to quality control. 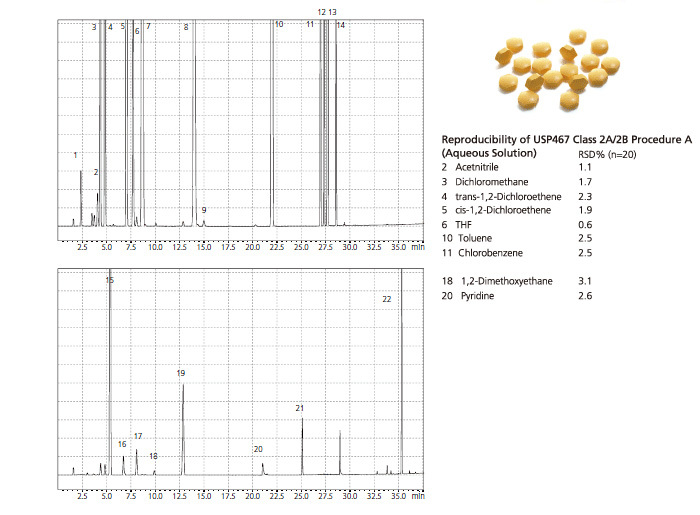 High reproducibility and low carryover ensure reliablequantitation. 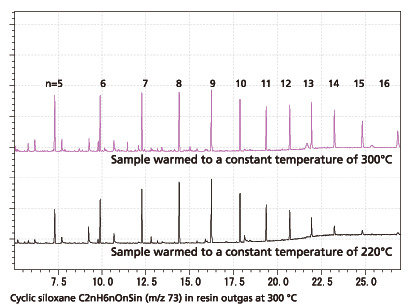 In addition, an oven with a maximum temperature of 300 °C enables analysis of high-boiling compounds. The HS-20 Series achieves high reproducibility through both high-accuracy flow rate control via the pneumatic flow controller (Advanced Flow Control: AFC™system) and a mechanism that allows sample vial to enter the oven from the bottom. Consequently, this system minimizes heat loss, and maintains high thermal stability during overlap analyses. 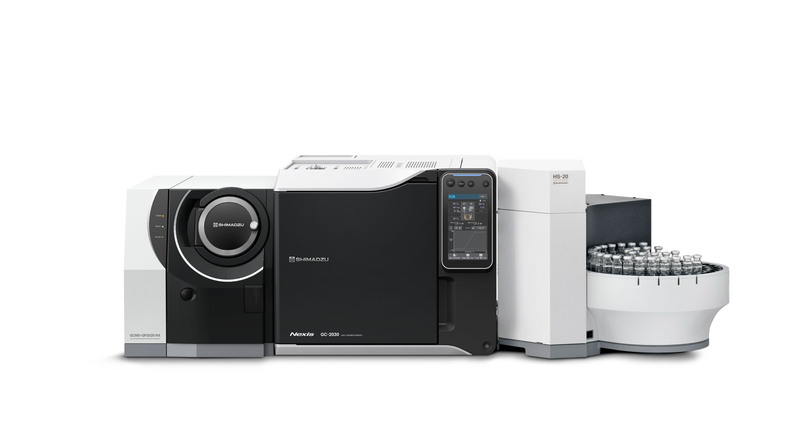 With an oven configurable up to 300 °C and a simple, inert sample line, the HS-20 Series allows the analysis of high-boiling compounds. Cyclic siloxane is a raw silicone material, trace quantities of which remain in oils, liquid rubber, and other products. Because cyclic siloxane is volatile, it could potentially cause problems with contacts in electronic parts, so controlling its concentration is very important. The HS-20 Series makes it possible to measure everything from cyclic siloxane to phthalate esters under the same conditions. Easily place samples in the tray with the user-friendly design. Also, the needle, sample loop, trap, and other consumables can easily be replaced from the top of the instrument. The HS-20 sample tray is 20 cm higher than the desk,enabling it to be seen at all times. This makes sample placement easy. In addition, 10 mL and 20 mL vials can be placed and analyzed simultaneously without the need for special attachments. Furthermore, the optional barcode reader allows samples to be controlled using barcodes. The HS-20 Series has been designed to enable sample loop and needle replacement and other maintenance work to be performed easily from the top of the instrument. Even if sample lines become contaminated by high-concentration samples, the piping alone can now be replaced. Also, the capillary column joints are shared with the GC sample injection unit, enabling easy column replacement. This superior design minimizes downtime during maintenance and improves laboratory productivity. 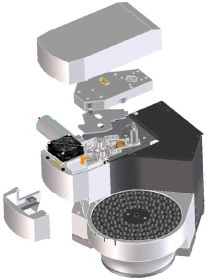 With the trap model, concentrating the headspace gas enables the analysis of ultra-trace components, such as gases released from parts and materials. 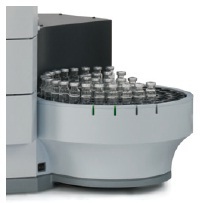 The optional barcode reader enables samples to be controlled via a chromatography data system. The HS-20 trap model is equipped with an electronic cooling trap that concentrates the headspace gas, enabling high-sensitivity analysis. By using hydrophobic Tenax, the trap enables the analysis of low-boiling compounds by concentrating them to high-boiling compounds in samples containing moisture. Method files make it easy to switch between trap and conventional modes, in which a sample loop is used. The two modes can be combined even in continuous analysis via batch processing. In combination with a GCMS, the high-sensitivity electronic cooling trap enables qualitative and quantitative analyses of fragrance components at trace levels undetectable with a conventional headspace sampler. With its high thermal stability and inert sample line, the HS-20 Series can measure VOCs in wastewater with high reproducibility. Carryover is minimal, so the sample tray, which is capable of holding 90 samples, can be effectively utilized. In combination with a robust GC detector, the system can be used for quality control requiring high quantitative accuracy. Traceability is guaranteed by the all-sample leak check function and the digitized log function. Analysis of blood and other samples in the forensic field requires a system that not only offers excellent performance, but also eliminates operational errors. With its user-friendly design, the HS-20 Series prevents mistakes, while the barcode reader records logs to dramatically improve traceability.